Animated GIF Creator is, probably, one of the most simple solutions to create animations in GIF format, one of the most used formats over the Web, because it's a very lightweight and versatile option. The program is very easy to use, it is only necessary to select the photos or images that we want to place on the banner or animated image that we want to create, once we have done this, we will have to change the properties of each of the different files (transparency, size, exposure,...), after we have done this it will be possible to preview our work and export it to the folder of our choice. Despite the program's graphic environment being rather dull, it is very easy to use and the results that it offers are brilliant, making the appearance relatively unimportant. 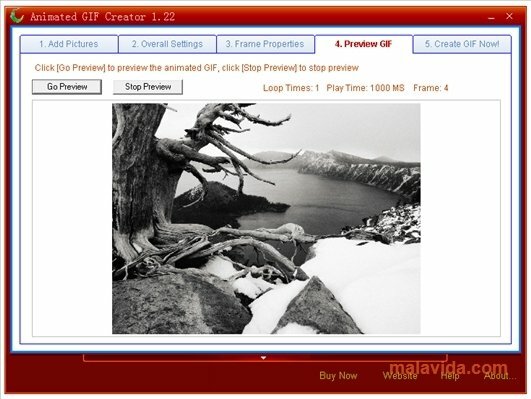 If you were looking for a program with which you'll be able to create animations, buttons and banners, download and try out Animated GIF Creator.